Office 365. Flexible and mobile business tools. Flexible and mobile business tools designed for your organisation. Office 365 is not the latest release of well-know and highly valued Office. It is much more! 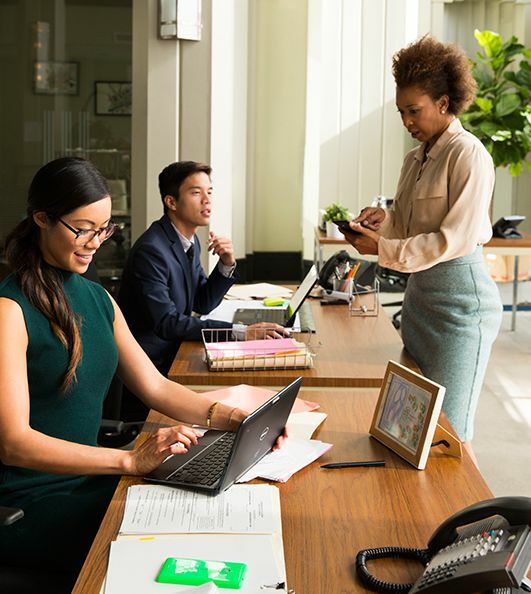 Beside the standard package, the solution empowers you with modern business apps that streamline collaboration and management in your company. 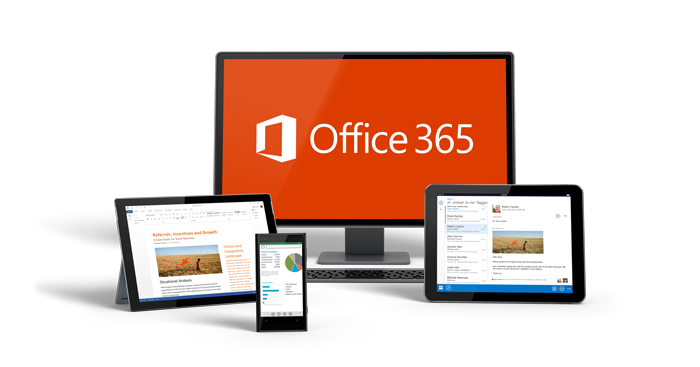 Office 365 is a cloud-based service package hosted by Microsoft which combines popular Office applications and useful features such as professional e-mail, instant messaging, shared calendars, videoconferencing and file sharing. Office 365 provides your organisation with reliable tools that until now have been used only by large organisations. Now, they are provided as a package. Office 365 offers you many more benefits without any additional investment in your IT infrastructure. Work effectively wherever you are! From any device at any time! Outlook is the primary tool to communicate with your customers and teams. Create documents using embedded styles and new editing capabilities on your touch screen. Collaborate with your team to create stunning presentations. With improved presentation tools, you can communicate your ideas and win over your audience. All your notes are always at hand, stored in one place. OneNote is your digital notebook where you can enter your to-dos, meeting minutes and any other information worth remembering. Excel offers you intuitive interfaces for data analysis. With the new methods of data visualisation, you will see all information you need from a new angle. This user friendly and simple tool has been designed to create and share professional and personalised publications that will attract and influence your customers. Use the Office package even on 5 PCs or Macs. Now, each user can use Office desktop applications on 5 PCs or Macs in any location. Working in the cloud, enjoy the easy upgrade to legal versions of Office and your desktop applications. When you are on the go, download and edit your business documents using Office apps for iPads and iPhone as well as Windows and Android-based mobiles. Work with your documents from everywhere and save your Office documents on a virtual drive to create backup automatically and access the stored documents from everywhere. Use the unlimited capacity of cloud computing. With OneDrive for Business, you can store your data in a 1TB virtual data warehouse which is synchronised with your devices. Office 365 enables you to share any business documents within your company and assign the edit or read-only rights to selected users. You can view all documents in a Web browser on any device, which is particularly useful when you do not have your own device at hand. When logging via a Web browser, you can access all your documents and setup. Download the free Office 365 version and test it for 30 days without any limitations! Office 365 is a professional and advanced tool designed to streamline work in your organisation. Owing to its configurable setup, you can tailor Office 365 functionality as you need and use it to the full. We encourage you to use the implementation services we offer. We will support your team to increase their efficiency with Office 365.
extendo.pl is a member of the IT.integro Group – the leading Microsoft Dynamics NAV partner in Poland. With experience and knowledge gained in many implementation projects, we can ensure top-level service and customer satisfaction. We do not only implement Office 365, but also deliver trainings to users to enable them to use the functionality of Office 365 to the full extent.